Brendan Kearley is from the Isle of Wight. He is in his mid 20s and wants to see the world. He has recently been awarded £2,000 from The Stephen Thomas Bursary towards the Superyacht Crew Training course at UKSA. The bursary is money donated in memory of Stephen Thomas, a keen adventurer and ocean yachtsman, to help young people enjoy adventurous sailing at UKSA. This is his story: “In 2012 I was made redundant from a local major business. JobCentre Plus offered me the chance to take part in a Change Direction Programme at UKSA. I attended both the selection day and the interview and was successful in securing one of six places. During the programme a presentation given by an ex-UKSA student who was working on superyachts, inspired me to realise a career I could follow whilst still pursuing my dream to travel the world. Since completing the programme I have returned to UKSA on a weekly basis as a volunteer for the Duke of Edinburgh award scheme (DofE), where I work to support the young people enrolled to develop their skills, grow in confidence and ultimately achieve their bronze, silver and gold DofE awards. I have recently taken on more responsibility within the groups, delivering expedition preparation sessions and aiding in the recruitment of new young people to a new group. 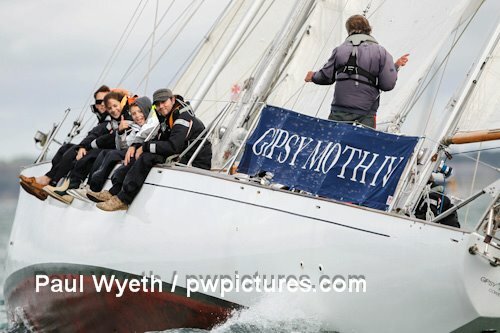 Through my involvement at UKSA I have twice been offered the amazing opportunity to be a member of crew on-board Gipsy Moth IV, the first time being for the annual ‘Round the Island Race’ placing 16th of 30 in the classics class. Recently I have been given the opportunity to become part of a crew from UKSA to enter the annual Association of Sailing Training Organisations (ASTO) race, taking place in October.